There's going to be a lot to explore in Arkham City, whether you're on its rooftops, or walking its streets. Lots of open world games try to impress you with how big their open world is, but Rocksteady is taking a different tack with Batman: Arkham City. Rather than impress players with Arkham City's size, it wants them to marvel at the game's attention to detail. 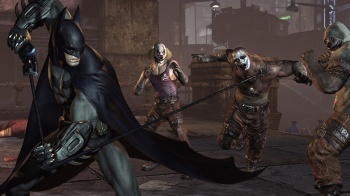 Rocksteady's Dax Ginn said that moving the Arkham City gameplay into an open world setting was something that the team had really wanted to do, not only for the technical challenge, but for the creative challenge and the gameplay opportunities, too. He said that Rocksteady wanted to explore a sort of middle ground, where the game world was still on a "massive" scale, but had an amazing amount of aesthetic fidelity when the player hit the streets. Exploring the city will have its benefits too; there will be all kinds of side quests for the player to do, such as hunting down assassins, or stopping serial killers. Ginn also said that psychology will play a big part in the game, both in terms of the narrative, and of the gameplay. Each of the playable characters - Batman, Catwoman, and with the right pre-order, Robin - had an alternate vision mode that gave them more information that just their regular eyes, but the characters different viewpoints meant that they focused on different things. Batman's detective vision was for helping to solve or prevent crimes, while Catwoman's thief vision was for helping to commit them. Rather worryingly, Robin's alternative vision mode helps him identify things that he should blow up.